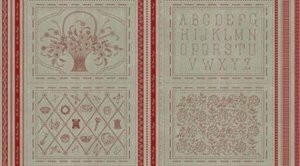 Preprinted 100% linen panel to embroider and create your very own masterpiece. It will look stunning in a frame or made into pillows when you've finished it. You can create 4 individual 15" x 12" works of art. You could also incorporate all 4 into a coverlet or lap size quilt. This panel measures 24" x 44" and includes all 4 designs.